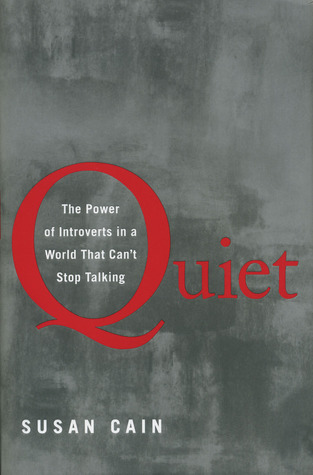 This month for book club we are reading a non-fiction book called Quiet: The Power of Introverts in a World That Can't Stop Talking by Susan Cain. I was very hesitant on picking this book up because I already have a few non-fiction books on the go. Adding another didn't seem like a good idea. And it is, however I am enjoying it. So these are this weeks questions 1. Do you consider yourself an introvert or an extrovert? How/when did you discover this? Do the people in your life (friends, family, coworkers) understand this about you and what it means you need? I am definitely an introvert. Though for many years I have played being an extrovert. I knew I was being drained and it was slowly making me sick and hate working. I quit my job on January 2 and since then have hidden away at home. I feel like I am slowly recharging. My family definitely doesn't understand why I am not yet looking for work. They don't understand that I am so overstimulated that I need this space at home. 2. It was interesting for me to learn that the rise of the Extrovert Ideal coincided with the increasing move into urban areas, working in factories and otherwise interacting with strangers. Do you think our culture will swing the other way now with more and more people working online exclusively, from home or with limited work contact with others in person? I don't think the extrovert ideal is going anywhere. But I do think it's changing. With the online community and the shift to working at home, introverts can start to thrive more. 3. What is the difference between being extroverted and being a leader? Is there a difference? Do they always go hand in hand? (Do you think the quiet leaders detailed in the book ever had to fake being extroverted on their way to the top?) Extroverts don't listen, this is the major reason I just quit my job. My boss is very much like Tony Robbins first mentioned on page 34. She is absolutely the worst manager I have ever had. It was a great growing experience for me, to understand how I could not work with a person like that. Many of my previous managers are fake extroverts who have made their way to the top, and that is why a lot of them are still some of my favorite people. I think that whether a leader is an extrovert or an introvert how they deal with things greatly comes from their life experiences. Some extroverts may handle things poorly. While others may have a good balance. Some like my old manager may hopefully grow into the role better as time moves on and they evolve. The one thing I wish I could include on my blog is the Facebook conversation. It was so interesting reading people's answer to the questions and seeing the different views. If you would like, join the NovelTea Book Club here. Other Things: Having only it made it through the Introduction and Chapters 1 & 2, there's a lot of highlights I would like to share! "Introverts living under the Extrovert Ideal are like women in a man's world, discounted because of a trait that goes to the core of who they are." Introvert People that surprised me: Eleanor Roosevelt, Warren Buffett, Gandhi, Rosa Parks. "It implies that every encounter is a high-stakes game in which we win or lose the other person's favor" - this is how I felt about work. Every person I met was that "potential" customer and when I didn't get them as a customer SHAME. Chapter Two - Does God Love Introverts? An Evangelical's Dilemma I don't do religion. When it's in books I usually put it down and refuse to pick it up, unless I am doing it for a specific reason or for research. So when Chapter two dedicated a whole section to religion I was disappointed. But then I started reading. I underlined a lot of this section. Because it put into words what I use to feel when I did attend church. "Events like this (as in big church services) don't give me the sense of oneness others seem to enjoy, it's always been private occasions that make me feel connected to the joys and sorrows of the world." " "Everything in the service involved communication," he says with a gentle exasperation. "Greeting people, the lengthy sermon, the singing. There was no emphasis on quiet, liturgy, ritual, things that give you space for contemplation." And this one remembers me of On the fence Christians (ones who are Christians on Sundays and the worst during the rest of the week) "If you don't love Jesus out loud, then it must not be real love. It's not enough to forge your own spiritual connection to the divine; it must be displayed publicly." When I started reading, I identified myself as a True Introvert. In fact when I took the Jung Test (test number 1) and the 16 Personality Test (test number 2) my introversion was excessively high scoring. But the more I read into the book and reflect on my past, the more I think the test results are subject to how I am now feel. I have always been shy but until I worked for the bank I have always been up to anything and have always hated being home. 10 months of working at the bank I switch to a back office position where I was stuck in a cubicle all day. It was terrible, I hated every second of it until I was able to transfer out 10 months later into a role front customer facing. My role after that was even more, greet meet and direct, you had to be bubbly, out-going and able to multi-task events and clients. I loved almost every single minute of that job. The next role is what almost killed me. It was a slow drain of energy with no ability of recharging after two and a half years, I quit. This role is what has made me really turn into myself and what has made me feel like an introvert. It's going to take my body and mind a long time to recharge and that's what brought me test results above. I think I am more of a Ambivert - have introvert and extrovert traits, but in balance. I also think that because of how run down I've become, due to only playing on the Extrovert side of my personality, the introvert side is taking over very heavily right now to compensate. Eventually I will balance out (hopefully). It's an interesting time to read this book. I have been confused by what I've been feeling and this is really helping me understand and put it to terms. And so I am taking my time to read and understand. I want to retain what I read verses my normal reading pattern. March 13 - Questions 1) What are the benefits of working alone versus working on a team (when you are working on a creative project)? Which do you prefer or find more useful? In what circumstances? My one team experience was in a severe sales role. Where we depended on each other to run events but the sales numbers were your own. It was competitive and dysfunctional. I am not a competitive person so I was okay with not stealing sales, I also took longer with my clients and got a high rate of good clients verses my co-workers. However in the end it's a numbers game and that's all banks general care about. This was not the best environment for me to work with. Now within my own personal projects where I am working with a team of people, we all work within our own homes and on our computers. Skyping when needed, we function as a team contributing equally but separately. It is my favorite way to work and I would love to find an actual paying job that allows me to do this. 2) How is your workspace set up and how does it affect your work? How does your online work and relationship differ from in-person? As I am not working, my personal projects are slow but steadily growing. I am learning on to manage my time and learning how to become productive in this environment. It's very different from every other environment I have ever worked within. I also have to remember to keep myself motivated. I read best when I am fresh from a trip out or late at night. So I have adjusted my schedule to accommodate for this. In person I now come across as shy and quiet. When I was working I was rather bold and would direct approach. I am amazed at how much I have changed since January 2. 3) Nature vs Nurture -- Have you observed one or the other in your own life? This is such an interesting concept. My nature is Ambivert as mentioned above. But I nurtured myself into a very extroverted role. Now that I have been removed myself from that place I find I am very introverted. I think as I grow I will balance out more. I have definitely observed both within my life. 4) What is your sensory "sweet spot"? How much stimulation is optimal for you? My sensory sweet spot is a phone call, skype date or coffee date with a gorgeous friend a few time a week. These keep me motivated and consistently able to produce good work. I find that if I don't allow myself those meetings or arrangements I get way less done and start to depress which is never a good sign. I just have to remember not to hide from those amazing people. When reading fiction I can read 50 pages in a half hour. So a book that is 271 pages (in the case of Quiet), I should technically be able to devour it under 3 hours. However this hasn't been the case. I read a page here or there wait a day or two and then end up rereading it. It's a struggle. I am glad for the learning experience of the book. It's taught me allot about myself. But as of now I am only on page 166 and that's 111 pages short of the end. I am choosing not to finish this book. But to one day come back. I want to save the questions from book club that I haven't yet answered for that time as well. 2) What do you think would be the best way for extroverts to slow down and be more thoughtful, or for introverts to embrace spontaneity/adventure? Experience, it comes down to learning when you need to slow down and when you need to embrace spontaneity. But its variable for every person. 3) Soft power / quiet persistence -- Do you have any introverts in your life who demonstrate this quality? Do you think they are leaders or influential? Do you notice any advantages or disadvantages to quiet persistence? Yes, I know a few people. I believe they are both leaders but that neither have yet to find that niche. Quiet persistence reminds me of the tale of the Bunny and the Turtle - slow wins the race. 4) Does anyone in this group consider themselves an ambivert (both extro- and introvert fluid)? I am definitely an ambivert as mentioned in the earlier. That was very enlightening for me. I am very curious how I will change over the next few years. 5) Do you pretend to be the opposite of your true nature when the situation warrants? If you’re an introvert, do you make an effort to be more outgoing? If you’re an extrovert, do you make an effort to be more circumspect and observing? Do you have any problem with people who act the part? As an ambivert I do play to whatever side is needed at the time. Most times this doesn't affect me negatively unless I play one side for too long :) I don't have a problem with people who act the part, as long as they are happy with themselves and stay true to who they are. The unanswered questions for one day! March 27th Questions 1) The communication gap -- I felt like Chp 10 did well at illustrating the communication gap between introverts and extroverts, but not really how to overcome it. Thoughts? Recommendations? Have you experienced similar fights/discussions in your own life? 2) Susan Cain calls for a Quiet Revolution. Would you like to see this kind of movement take place and if so what is the #1 change you’d like to see happen?